After three years in the trying-to-conceive (TTC) camp, I know extremely well how agonizing the two-week wait between ovulation and either pregnancy (hopefully!) or your period can be. You spend the first half of your cycle waiting and excited to start “trying,” then you try a few times (always a bit extra for good measure), and then boom — the exciting yet excruciating long two-week wait. And unlike two-week vacations or summers of your youth that flew by in what felt like the blink of the eye, this two-week wait takes FOREVER. You do what you can to stay upbeat and positive — and, honestly, try not to go too crazy either imaging your pregnant belly-to-be or how disappointed you’ll be if this month isn’t your month. 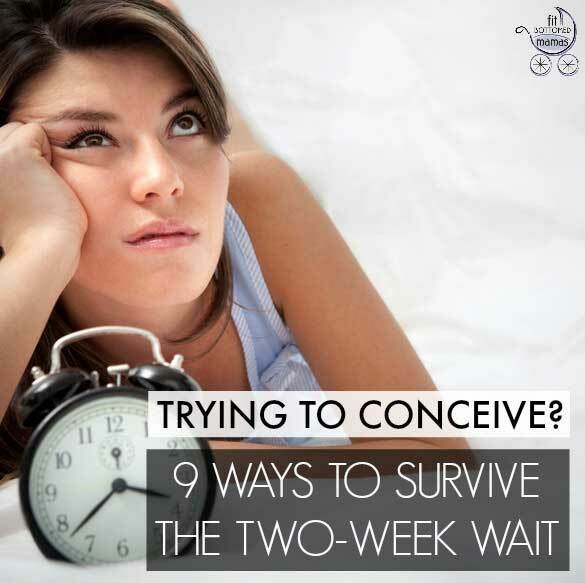 Double the anxiety if you’re undergoing fertility treatments. 1. Plan something fun to do for every day of your wait. This is my no. 1 best tip to getting through the two-week wait and being happy during it. For each day of your luteal phase, schedule in your planner — in pen! — something you’ll look forward to. It can be as simple as 15 minutes of reading from your favorite book, watching your favorite TV show, or something more elaborate like a dinner date with your husband or your best friend, or even a massage or a pedicure. Heck, even taking 20 minutes to give yourself permission to window shop or buy yourself flowers can give your day little perk — and give you something to look forward to every day, and not just in two weeks. 2. Meditate. Yep, we’re gonna go hippity-dippity on you. Meditation has been shown to decrease stress and anxiety and generally improve your health and well-being. So take this two-week wait as an opportunity to begin to develop a meditation practice. It doesn’t have to be fancy, airy-fairy or hard at all. Even sitting quietly and breathing for 5 minutes counts! 3. Stay busy — even if it means cleaning out closets. Have a lot of to-dos that never seem to get done? Or been putting off getting that eye exam or washing those windows? Now is the time to check those to-dos off. Granted, you don’t want to run yourself ragged, but being on the go (best if you can be out with others, too!) a little bit more than usual is good mentally for you during this time. So if someone asks you do something, do it! 4. Develop a mantra. Whenever you find yourself worrying or obsessing about getting pregnant, have a phrase or two at the ready to help you calm down and remember that worrying won’t help you get pregnant (or help you be happy). Any kind of mantra can work — from a simple word like “relax” to a whole prayer to a phrase. All that matters is that it matters to you and helps you remember that at this point, things are out of your hands. 5. Journal. If the mantra isn’t working or you’re having to use it A LOT, consider busting out the journal and putting those feelings down on paper. Write down your hopes and wishes. List out your plan A, B … and any other plans that’ll help you to feel like it’s going to happen. Don’t worry about spelling or grammar or even if it makes sense. Just emote and get it off your chest. 6. Hold off on testing for as long as you can. I know this is a hard one because the urge to test at, like 6 DPO, is so strong, but try to wait at least until day 12. Day 10 if you can’t do that. It’s hard, but there’s nothing worse than seeing a negative test, and why put yourself through that if you don’t have to? After all, the statistics on getting a positive test and DPO are pretty clear. 7. Breathe. Find yourself worrying and worrying and obsessing and obsessing? And then worrying and obsessing about your worrying and obsessing? That’s normal. To help, no matter where you are, just breathe. Breathe deeply and fully, breathing in for four full counts, pausing for 2, and then breathing out for four more. Sometimes, you just need a little oxygen — and a mental break — to feel a little better. 8. Make a feel-good playlist. During your two-week wait, really make a point to do stuff that makes you feel good. And a really good way to do that is to make yourself a feel-good playlist. Doesn’t matter if it’s guilty pleasure tunes, Britney or Motown, pick a bunch of songs that make you feel awesome and uplift your spirit. Then, when you need a pick-me-up listen it to over and over again. The track that has gotten me through lots of two-week waits? “Anything Can Happen” by Ellie Goulding. The right song at the right time really can make you feel better! 9. Be mindful and present. During the two-week wait it can be tempting to totally check out and try not to feel or think at all, but don’t waste this time. Even if it is your umpteenth two-week wait, it’s still half of your month! So don’t spend it miserable. Do what you can to try to remain happy, grateful and present. And, of course, if TTC and the two-week wait is making you overly anxious or depressed, seek professional help or a support group. No pun intended, it’s a trying time! I cannot say enough good things about tip #1! I have a dry erase calendar and at the beginning of a new cycle I fill out something for every one of the days in the two-week wait. It was a little tough at first to come up with things that I’d want to do on some random day almost a month out. But I found that checking that calendar once I was in the 2-week wait window was like getting a little present every day. What do I get to do today? Meditate. Paint my nails. Do yoga. Eat cake. Whatever it is, it felt like I was being so good to myself and gave me another place to focus my energy and thoughts. When I start to wonder “Am I? ?” I shift my thinking to one of the activities I did over the last few days. It restored my thinking and lifted my spirits. I think my big tip was to make a simple to-do list every morning. Yes, my life would change in a lot of ways if I got a positive test. But you know what won’t? The fact that I need groceries the following Monday. Or the fact that my sister’s birthday is coming up and I needed to get a gift for her. Or the fact that Days of Our Lives still has new episodes everyday that I HAD to watch. So I made a to-do list every morning, with even simple, little things. (pick up dry cleaning, finish that report for work, etc.) That way, I wasn’t solely focusing on big picture things, which was a big, fat unknown that would drive me crazy. This was nice and helpful.. I never comment on blogs or stuff but I wanted to give you some appreciation. I got a BFN today at 10DPO so I’m a bit bummed (a lot) but this helped quite a bit actually. There’s still hope. Thanks for the link to the statistics too. Thanks for sharing and ???! Still hope!